grainfields turns your monome 128 grid into a granular synthesizer with 8 voices - each with up to 10 constant streaming grains. 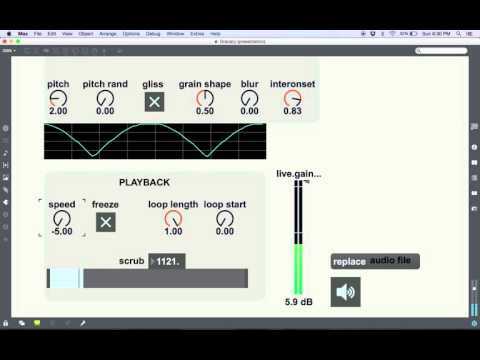 Live processing of audio inputs from a beer bottle and glass, using granular and spectral techniques in Max. 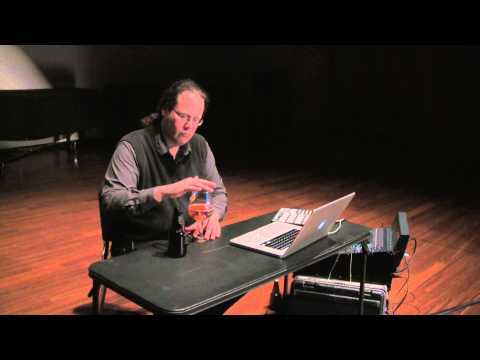 The whole soundtrack was realized using Max/MSP/Jitter/Max for Live. Cycling '74, a San Francisco-based music software company, today announced the release of Hipno 1.0, a new suite of over forty effects and instrument VST plug-ins for VST, AU and RTAS host applications. This package features an irresistible mix of granular, spectral, and filter/delay-based plug-ins featuring the unique Hipnoscope user interface. Also included in the package is an amazing set of processors that utilize live video input as a control source, and a new set of modulator plug-ins sure to captivate both the novice and long-time users of Cycling '74's Pluggo and Mode plug-in collections. Microsonic FM is a polyphonic granular synthesiser for Max4Live, based on quasi-synchronous granular synthesis techniques. The synth is built and run in Max 6 (+ Gen).